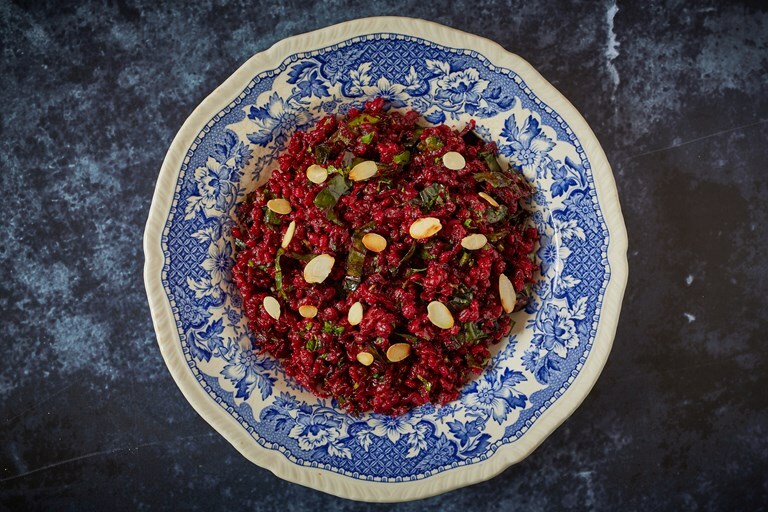 Rich, comforting, and fantastically vibrant, Victoria's beetroot and pearl barley pilaf recipe makes good use of the whole plant, from root to leaf. Using rich, slightly bitter beetroot leaves in the dish adds a pleasing body and contrast to the sweet, earthy beetroot and heady spices. Read Victoria's feature for further tips on using up veg tops and leaves. Who doesn’t like their dinner to be pretty in pink? This pilaf ticks all the boxes for colour and flavour while keeping food waste to a minimum. You don’t even need to peel the beetroot, which is a win in my book. I love the nuttiness of pearl barley, but you can replace it with white basmati rice if you prefer – just reduce the cooking time to around 15–20 minutes.